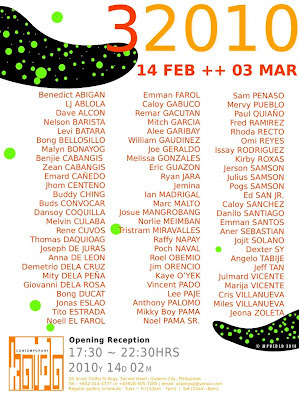 Kaida Gallery celebrates its third anniversary with 32010 on February 14, Sunday. It is all about art and numbers as the gallery opens its doors to the public with an impressive gathering of artists who have emerged in the Philippine art scene in the ‘80s, ‘90s and the ‘00s. In the tradition of Kaida’s annual grand exhibitions -- 1/50 in 2008 and 2/60 in 2009, the number of artists to be showcased is increased by ten, totaling 3/70 this year. 32010 sums up Kaida Gallery’s third of a series of anniversary group shows. Three marks the gallery’s years of commitment to the art community, twenty-ten represents the current year, and when put altogether, three multiplied by twenty with the ten added up equals seventy, or the number of artists participating in the exhibition. From its humble beginnings in its first arts space in Kamuning Road supporting up-and-coming painters and sculptors with several notable shows, Kaida Gallery near Timog Avenue is now expanding its sphere of resident artists. Balancing young and raw talents with award winners, mid-career practitioners and veterans of the creative industry, the landmark Kaida white tower always stands on guard for what is new, challenging and undiscovered in these diverse artists’ works. This event marks Kaida Gallery’s active participation in the celebration of National Arts Month, with a concurrent exhibition of chosen art pieces in Quezon City Hall. For more details, please contact (632) 414-4777 or +63-928-505-7285 or email aidahysg@yahoo.com.